I checked with all 3 contractors regarding bid status late last week. Contractor #1 was willing to make an appointment for this Friday to review his bid (exactly one month from meeting the contractors, as projected). #2 and #3 said they would be finished soon, maybe in a week. In preparation for bid meetings, I checked some books out from Newport Beach Public Library. Although many of the remodeling books had pretty pictures and nice ideas, I was really looking for specifics about running a project and hiring a contractor. 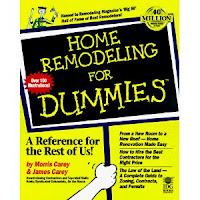 My favorites were Home Remodeling for Dummies (out of print, but you can buy used copies), Remodel This! A Woman's Guide to Planning and Surviving the Madness of a Home Renovation and 50 Plus One Tips When Remodeling Your Home (large print format but I wasn't offended). I also liked this these 50 Contractor Interview Questions online, by Tim Carter. Another great post about selecting a good contractor can be found at TrustyGuides.com. 1. What types of work are you licensed to do? May I have the license numbers? State, City, Federal Tax ID, legal business address and legal contact information. Are you the sole owner of the company? 2. How many people - direct employees - work for your company? 3. How many jobs does your company have in progress right now? 4. What is the average number of jobs you do at the same time? 5. Do you have any other outstanding bids right now? 6. How do you manage your jobs on a day-to day basis? 7. Who will be on-site and in charge of my job each day? 8. Would you agree to attend a weekly meeting between home owners, on site manager, architect and you to go over job, schedule, next steps, and problems? 9. What types of projects do you typically handle or specialize in? Do you specialize in remodeling projects, with jobs similar to ours? 10. What do you recommend to home owner’s who are living in the houses you are working on? How do you deal with pets and children? Keys? 11. Have you or your company ever sued anyone or filed mechanics liens before? 12. Do you use sub-contractors? 13. What is average length of time they have worked for you? 14. How do you like to handle mechanic’s liens and what do you recommend to protect the homeowner? Do you supply notarized affidavits or release of liens BEFORE I give you payments of any kind? Conditional Lien or Unconditional Lien release? Do you submit Unconditional Lien Releases from subcontractors and material suppliers for those phases of the work covered by a progress payment? 15. Who is your top material supplier? Who do you primarily deal with at the supplier and what is their location? 16. Have you ever declared bankruptcy or operated a company under a different name? 17. Do you warranty your work? Please describe. 18. How often do you clean up? How do you keep dust down? What do you recommend to homeowners in terms of minimizing the mess? 19. Will you be in charge of getting all the necessary permits, and arranging for inspections and sign offs? 20. Do you cover materials costs with our payments … or do you expect your customers to pay your suppliers directly? 21. Do you carry general liability insurance and workers’ compensation insurance; if so, how much are your policy limits? May I have a copy or proof of insurance? 22. Could I have several names and numbers of client references? Current and completed project. 23. Can I visit a current job to interview the owner and see how the job looks? 24. How long do you realistically think my project will take? I wonder if I'll have enough nerve to ask all these questions? Postscript several days later: Both husband and Architect reviewed the contractor interview questions. They think I am crazy, I can tell. Okay, so maybe I won't ask all the questions, but the process of researching the questions and thinking about who I wanted to work with on this job was a good one. And, I'll ask as many as seem relevant. And, I found a new book, Bathroom Remodeling for Dummies. Love the "Dummies" books.